A look back on 2016 reveals a year like no other for Tap Cancer Out. We hosted four tournaments, including our first in Philadelphia, which welcomed 1,150 competitors including 462 fundraisers who raised nearly $234,000. We also kicked off our newest giving partnership with the Pancreatic Cancer Network. Thanks to our fundraisers amazing efforts and our donors’ generosity, we concluded 2016 with a gift of $210,000 to the Pancreatic Cancer Action Network. Our gifts over the next two years will help the Pancreatic Cancer Action Network make significant strides in early detection, treatment, and improving clinical trial opportunities for patients. Along with a gift of $26,000 to St. Baldrick’s earlier this year, we were able to donate $236,000 to our giving partners in 2016. Special thanks to our sponsors and our hosts—Inverted Gear, Gabriel Richard Photography, Rollmore.com, Defense Soap, GrapplingX, Inkify, Verbal Tap Podcast, Chaos Kimonos, and BJJ Tees. Also special thanks to our gracious hosts —Bunnell High School, St. John’s Prep, United Sports, and the University of San Diego. 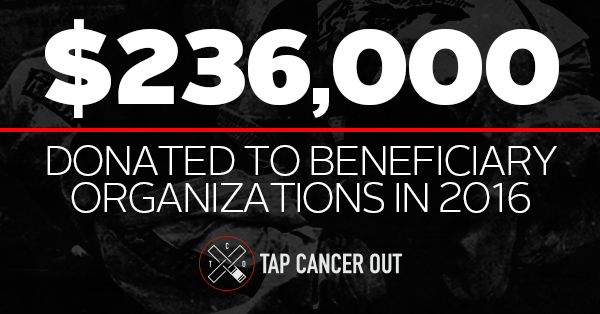 And of course, a major thank you goes to everyone who has followed and help spread the word about Tap Cancer Out. We can’t wait to show you what’s in store for 2017!